What does LinkedIn’s new InMail policy mean for you? That depends on how effective your InMails are and the response rates you can achieve. If you have a premium account with LinkedIn and haven’t been living under a rock, you are aware of LinkedIn’s InMail policy change which will, for most people, reduce the total number of InMails they are able to send. However, their new policy does open up the possibility of unlimited InMails, provided you can achieve a 100% response rate. Of course, even for folks with ridiculously effective messaging, there are a number of reasons why it is practically impossible to get a 100% response rate (e.g., people respond via email instead of through LinkedIn, people not logging into LinkedIn for long periods of time, people simply ignoring InMails, etc.). However, if you can figure out how to get a much higher than average rate of response, you can actually end up with more InMails under LinkedIn’s new policy than the old. 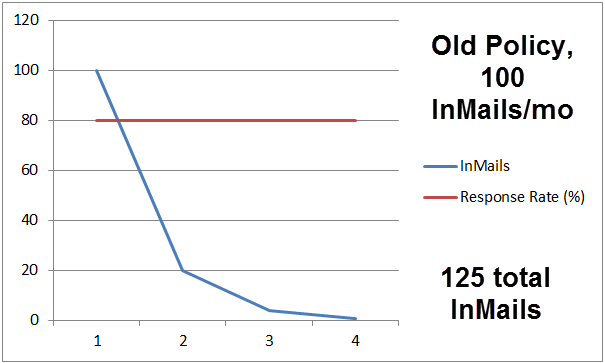 For the sake of simplicity, I am going to use 50 InMails per month to demonstrate the old InMail policy, and 100 InMails per month to demonstrate the new InMail policy. 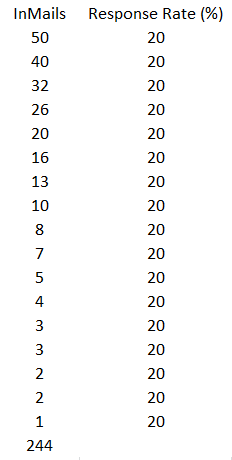 Additionally, I am going to use only 2 response rates in my examples, 20% and 80%, I am not going to over complicate things by trying to factor in the reality of variances in the dates of response to each InMail, and I am rounding all numbers, which can make some of the smaller numbers on the charts look odd, but you’ll get the point. 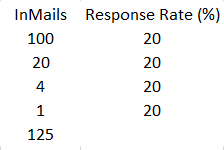 Under the old LinkedIn InMail policy, if you achieved a 20% rate of response on your 50 InMails/mo, you would be credited back 80% of the InMails you sent as they didn’t receive a response, which would be 40 InMails. If you then sent those 40 InMails out and continued to achieve a 20% response rate, you would get 32 InMails credited back to you, and so on. 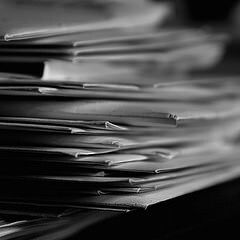 Ultimately, you could end up sending as many as 244 InMails from an initial monthly allotment of 50 InMails. As you can see, LinkedIn’s old InMail policy technically rewarded people with low(er) response rates by giving them more InMails to send. If you run the numbers for a 10% response rate, a person could end up being able to send over 400 InMails/mo from an initial 50 InMails! I guarantee you this was neither intended nor considered when LinkedIn devised their initial InMail policy. Even if you don’t like it, you can probably see why LinkedIn has made the change. No longer will highly ineffective messengers be essentially rewarded with the ability to send more and more ineffective messages to LinkedIn users. Believe it or not, this actually helps the rest of us who do try hard to send effective messages. Under LinkedIn’s new InMail policy, stepping up to 100 InMails/mo and staying at a 20% response rate, you would end up with about 125 total InMails to send based on InMails credited back to your account. Yes, you’re seeing that correctly. 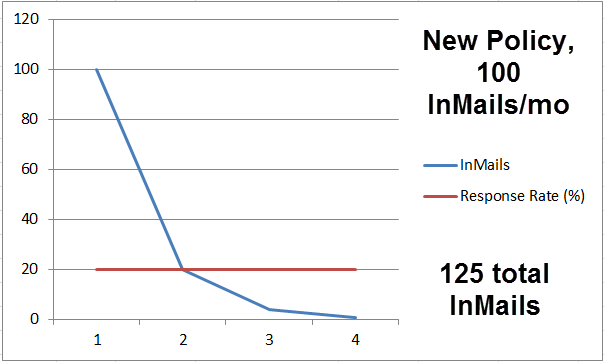 Under the new policy, doubling your monthly InMails coupled with a 20% response rate actually results in you being able to send about half as many total InMails (125 vs. 244) as you used to be able to send with half as many initial monthly InMails (100 vs. 50). This clearly demonstrates why many people are upset by the new InMail policy. Under the new policy, if you sent 100 InMails on the first day of the month and then resent your credited InMails back from responses, you could run out of InMails in 4 days. Of course, that’s assuming immediate responses, which is highly unlikely, but hopefully you can see where I am going. In theory, under LinkedIn’s new InMail policy, you could send about 295 InMails from an initial allotment of 100 if you could achieve an 80% response rate. You have to admit that this seems to demonstrate what LinkedIn is trying to do with their new InMail policy, which is reward effective messaging. In this example, a person with an 80% response rate and 100 InMails/month would be able to send about 21% more InMails under the new policy than some one getting a 20% response rate on 50 InMails/mo under the old policy. Is an 80% response rate possible? 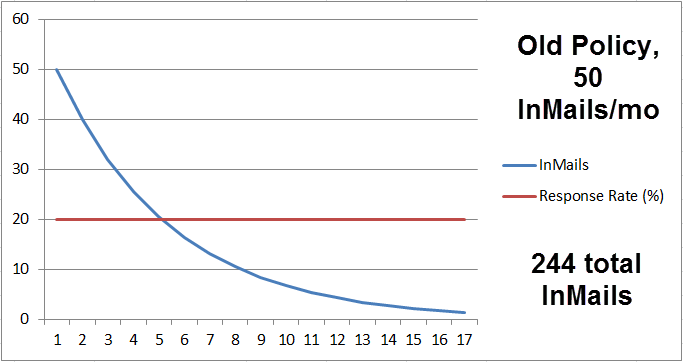 By the way, if you could get a 50% response rate, you would be able to send about 188/month from your initial 100. 40% would get you about 162/month from your initial 100. What About Effective Messengers Under the Old Policy? Interestingly, if LinkedIn increased your monthly InMail allotment to 100 and did not change their policy, and you were an extremely effective messenger and achieved an 80% response rate, you would actually be punished for having a high response rate, at least when it comes to the amount of InMails LinkedIn provides you. Do these numbers look familiar? That’s right – if LinkedIn gave you 100 InMails/mo and credited you only for InMails with no response (old policy), you would in theory only be able to send 125 InMails/mo even with an admirable 80% response rate, which is the same number of InMails you could send from an initial allotment of 100 and a response rate of 20% under the new policy. Ouch. In this light, effective messengers should rejoice over LinkedIn’s new policy. If you’re an effective messenger and can achieve high response rates from your InMails, the new policy is great, and certainly a dramatic improvement over the old policy, which actually punished people with high response rates when considering the amount of InMails LinkedIn credited to people with very low response rates under the old policy. 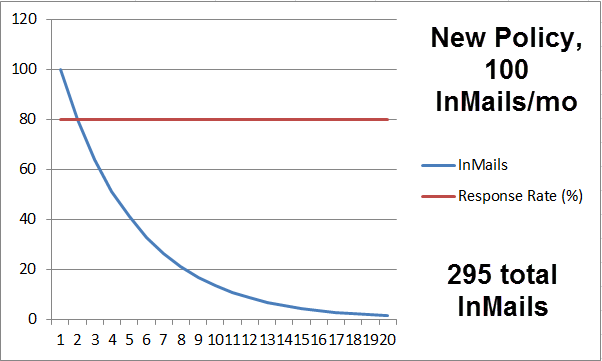 On the other hand, for people who are ineffective messengers (including spammers, of course) and those people who simply can’t achieve high response rates, the new policy will appear to be a curse, significantly reducing the number of InMails they can send when compared to the massive InMail credits they would have previously “earned” from their low response rates. Oh, and let’s not forget that if you could get a 100% response rate, you could in theory be rewarded with unlimited InMails, whereas with the old policy, you would be rewarded with 0. Of course, as I noted above, there are many challenges to achieving very high response rates from LinkedIn InMails, even for people who craft dynamite, highly personalized messages, and this means that the value proposition of LinkedIn licenses might change significantly for some folks and companies. In any event, I hope you enjoyed my basic visualizations of the old vs. new LinkedIn InMail policies.